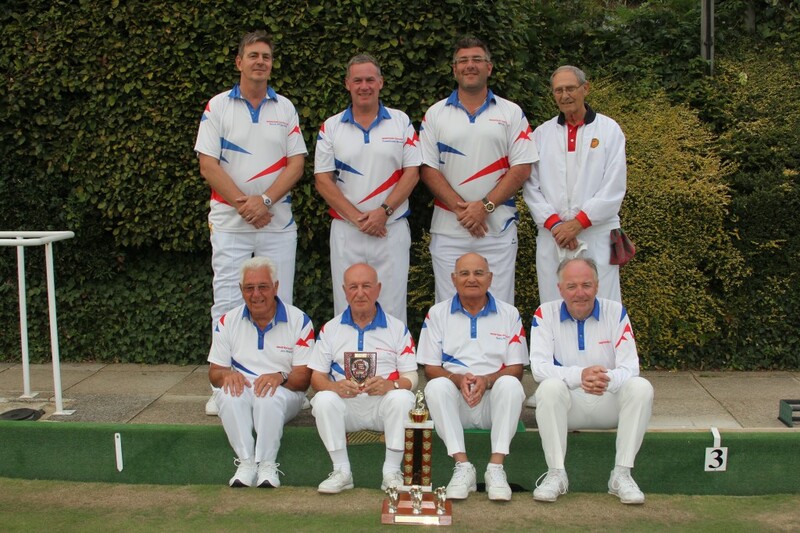 Saturday saw the London Parks Bowling Association Finals day which was held at Romford BC and it turned out to be a successful day for Central as they went home with four trophies. The morning session saw an all-Central final for the “Haven” Cup which is the Triples Championship. Unfortunately it turned out to be a one-sided affair as Daniel Hughes, Colin Foster and Kevin Fitzgerald totally overwhelmed the luckless Trevor Welton, Peter Norgate and Len Welton by 26 – 4 shots. Playing at the same time was the “Clarke Bowl” Trophy final which is the Fours Championship. This was contested by a Central foursome of Colin Jones, Russell Hughes, Paul Woodford and Paul Whellams who were up against Neill Warren and his foursome from Phoenix BC. It was the Central boys who took control from the off and maintained their supremancy throughout to eventually run out 24 – 10 shot winners. 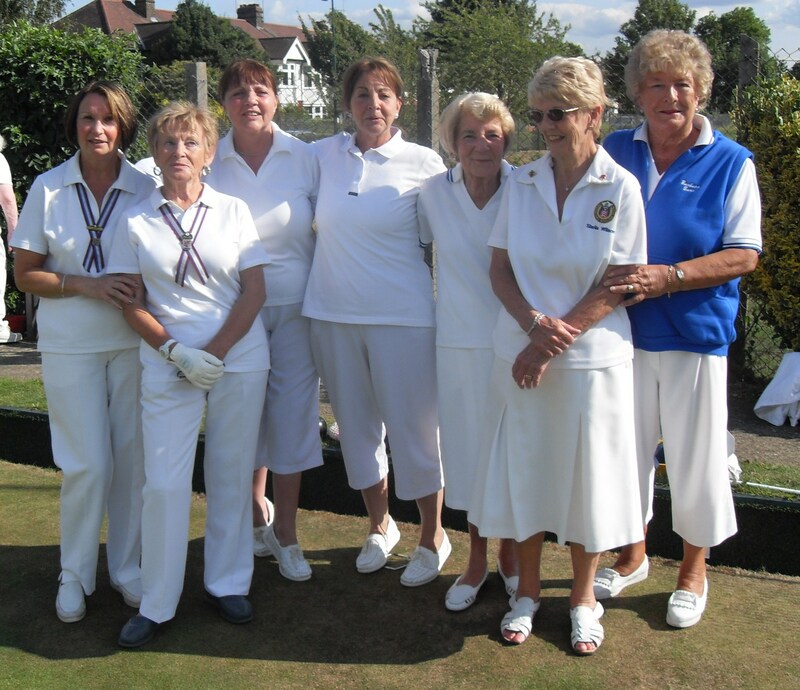 The Central foursome have now won back to back finals having won the trophy last year. Maybe a hat-trick of wins next year !! Central’s only set-back on the day also came in the morning session when Dave Waters and Steve Welsh took on Perry Cook and John Burke from Poplar BC in the final of the “Prescott Bowl” trophy which is the Pairs Championship. In a fluctuating contest it was the Poplar boys who eventually edged home by 24 – 20 shots. 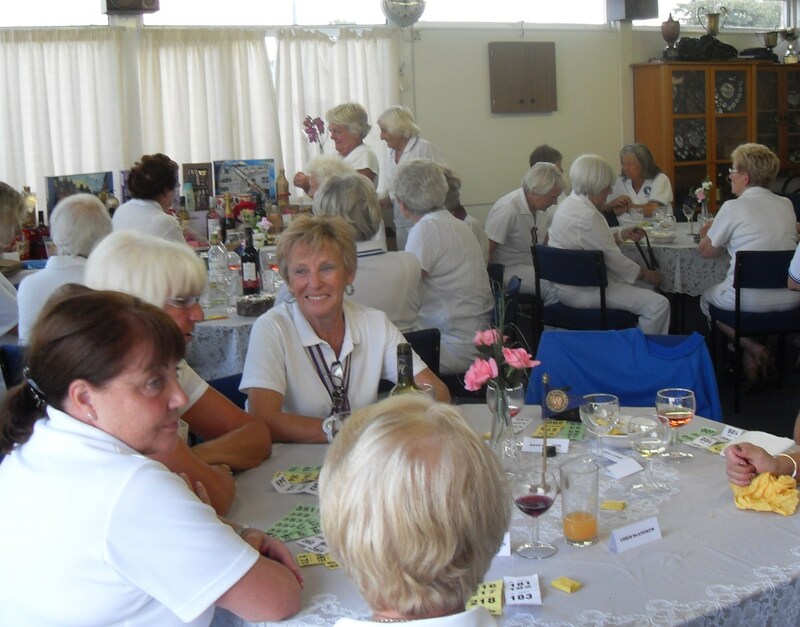 The afternoon session saw the final of the “Perfection” Cup which is the Club Secretaries Championship. 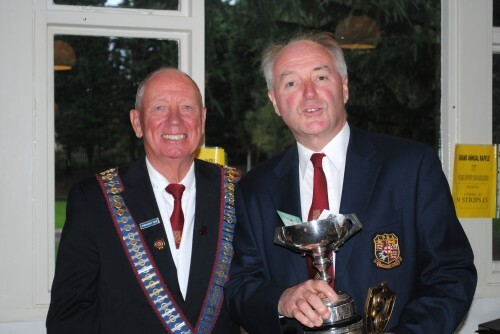 Central’s Steve Welsh took on Richard Foot from Bolingbroke BC who won the trophy last year. In another fluctuating contest where the match was level at 15 – 15 shots it was the Central man who gained the initiative to eventually win the trophy by 21 – 15 shots. 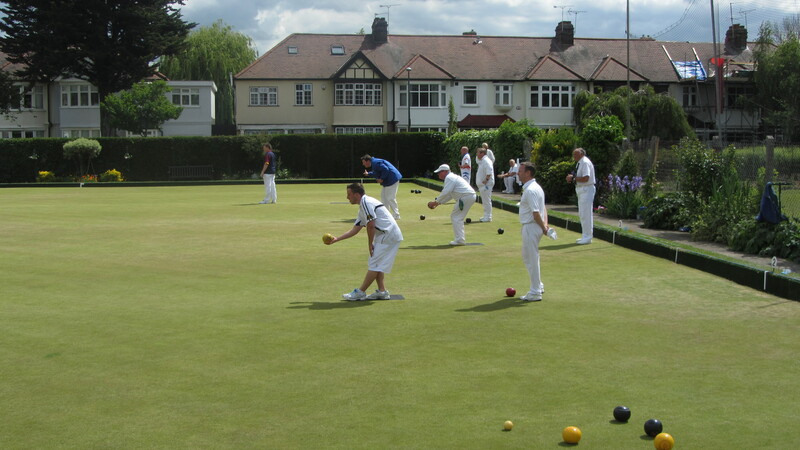 The climax to the day was the final of the “Jackson” Shield in which Central were up against old adversaries Ilford BC in what promised to be a mouth-watering contest. And so it turned out to be as Central edged home by an overall 56 – 52 shots despite winning only one of the three rinks contested. At the halfway stage Central seemed in complete control , comfortably leading on all three rinks and some 19 shots ahead overall. Ilford however came back strongly and Central’s overall lead was gradually whittled away to only 2 shots at one stage. 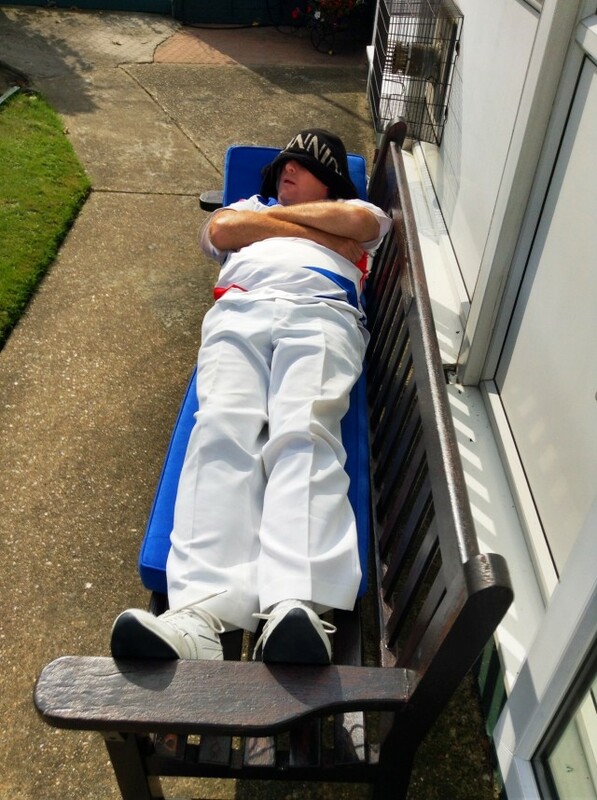 At the end of the day Central were indebted to the rink of Colin Jones, Len Welton, Paul Woodford and Mitch Brenner who defeated Ilford’s Ian McConachie, John Cook, Matt Frost and Bill Beney by 19 – 13 shots. 19 – 20 shots. This was after the Central boys dropped 7 shots on the last three ends. The final rink saw Russell Hughes, Jim Reynolds, Kevin Fitzgerald and Paul Whellams eventually lose out by 18 – 19 shots against Lee Parnell, John Kennedy, Terry Hughes and Dave Betts after holding a commanding lead earlier in the contest. A highly successful day for Central. 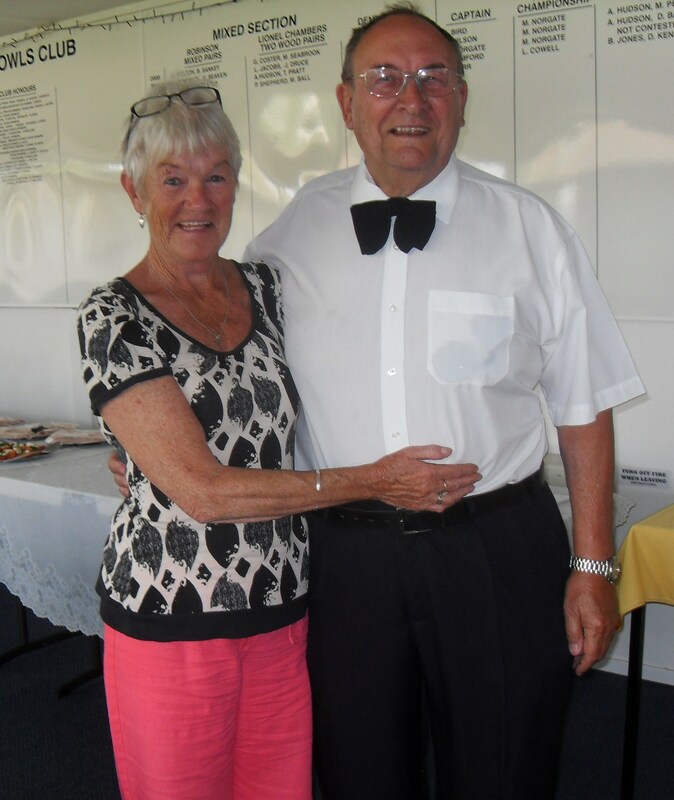 Sunday saw the Group V Finals Day and it was a very good day for the two Central teams contesting finals and also for Rod Hudson who won the “Dane Bowl” Champion of Champions trophy. 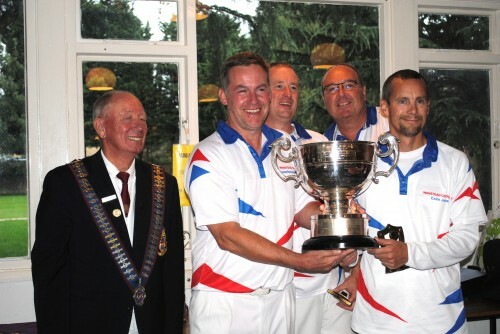 In the morning session Central’s “A” team took on Aldersbrook BC in the final of the “Cordell” Cup which is a three rink “Fours” competition. It was the Central boys who triumphed with an overall 79 – 50 shot victory after winning two of the three rinks contested. Central’s rink of Mick Bird, Kenny Ruston, Terry Lichkin and Russell Hughes were in fine form as they steam-rollered Ian Foote’s foursome by 35 – 12 shots. Keith Lloyd, Daniel Hughes, Len Welton and Bob Druce followed suit with a convincing 28 – 11 shot win over Joe Stagg’s foursome to all but seal the match. There was some consolation for Aldersbrook when Gary Gray’s foursome defeated Colin Jones, Ken Spicer, Colin Foster and Paco Rodrigues by 27 – 16 shots. 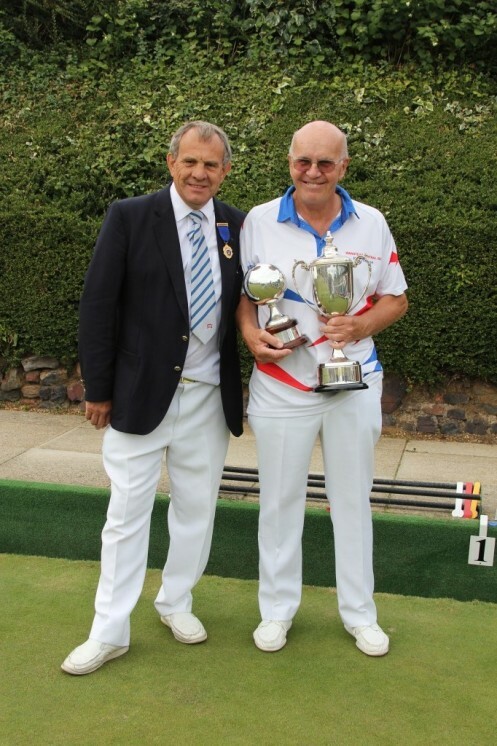 In the afternoon session Rod Hudson took on Peter Barham from South Woodford BC in the final of the “Dane Bowl ” trophy. In a rivetting match that went to the wire it was the Central man who eventually triumphed by 21 – 20 shots ,winning the vital end by a single shot after the match was level at 20 – 20 shots. An excellent match that was great entertainment for the large watching crowd and a credit to both players. The last match of the afternoon to be completed was the final of the “Beckett” Trophy which is a two rink “Fours” competition. Central’s “B” team took on Ford Sports BC and it was another match that went to the wire and kept the crowd on their toes as the Central team eventually squeezed home by a single shot 36 – 35 shots. The first rink to finish saw Gerry Rose, George Coster, Steve Welsh and Mitch Brenner under the cosh as they went down by 14 – 24 shots against Steve Wilson’s foursome. It needed Central’s other rink of Lou Jacobs, Jim Reynolds, Kevin Fitzgerald and Paul Whellams to redress the balance against Bill Parsons’s foursome. Going into the final end the Central rink were holding a 12 shot lead ( 2 shot advantage overall ) but the motormen then held a match winning three shots before skip Paul Whellams with his final wood drew second shot to give Central the match by a single shot. 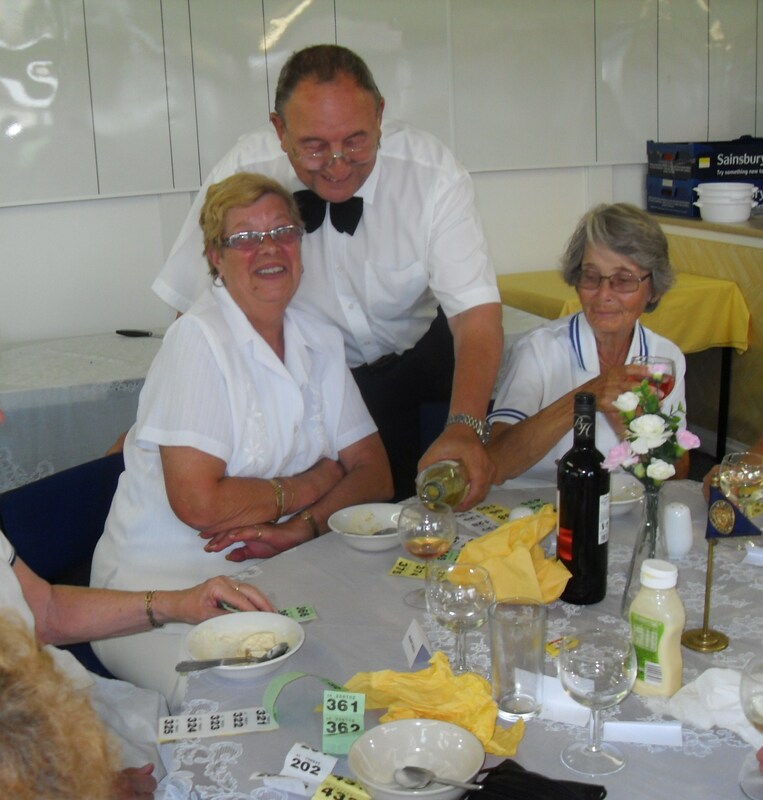 A fitting end to a great days bowls. 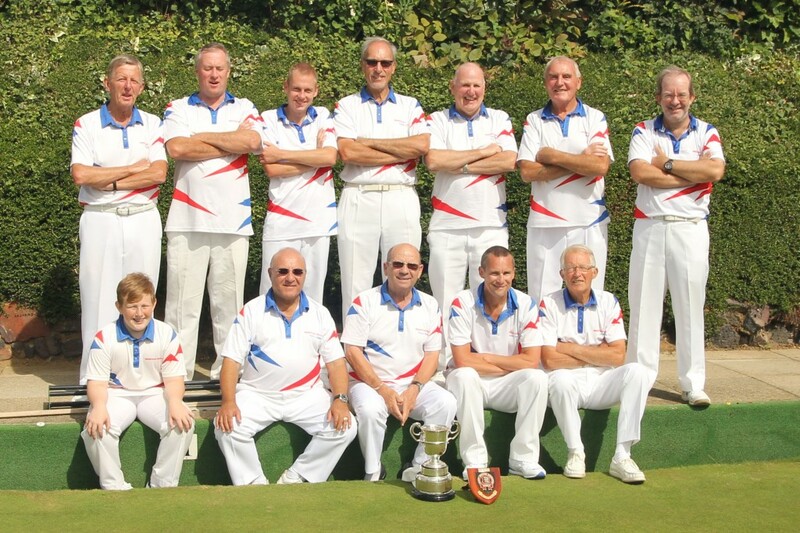 The only disappointment on Sunday saw Central’s Paul Woodford lose out in the final of the County “Benevolent” Cup. 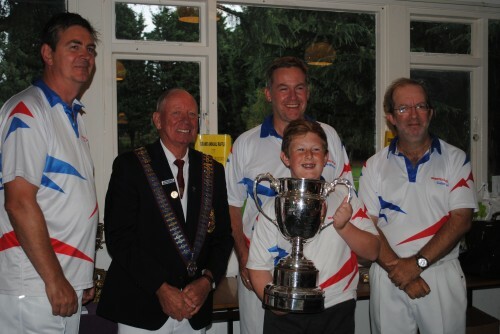 In the final played at Braintree BC Paul went down by 11 – 21 shots against Adrian Papple from Silver End BC. It was a below par performance from the Central man as he failed to match the form of previous rounds in the competition. Paul Whellams and Mitch Brenner played for Essex in the Middleton Cup semi-final against Berkshire at Worthing. 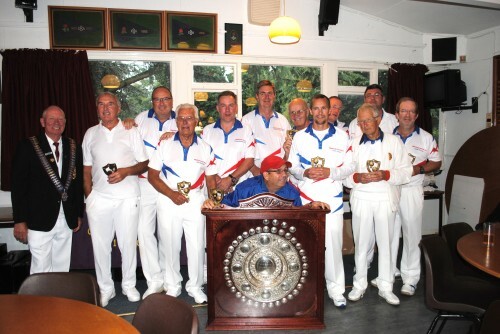 Essex agonisingly lost by 98 – 99 shots and Berkshire went on to defeat Devon in the final. On a gloriously sunny day 48 ladies took to the Green – a mixture of Wanstead Central ladies and their guests. 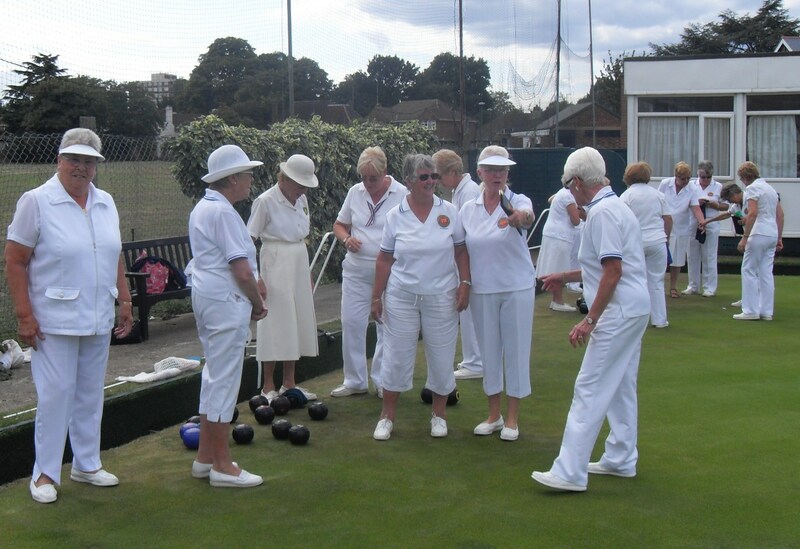 Here they are preparing to play 18 ends of “friendly” bowls! Here we have the President’s rink with guests from Silverthorne, Barley and Woodford, together with two of Central’s newest lady bowlers – Chris McAndrews and Jacky Lee. “Look out” says Jean Druce “you’re on camera”. 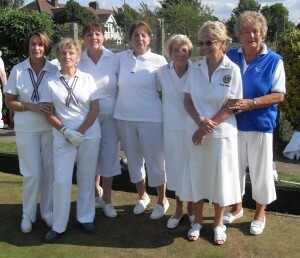 More Silverthorne and Barley ladies in this group with Vice Captain Maureen Pedraza. “One of the staff” Isabel trying to charm the wine waiter for an extra glass or two! However, one of our guests – Ronnie Berry from Hainualt – seems to have beaten her to it! 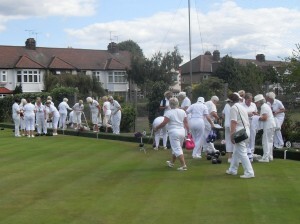 Things were very close across the three rinks in the first few ends and both teams had a turn with the lead. But by the 9th end the combined scores were level at 25 apiece. Then Central stepped up the pace with a burst of two 5s on Paul Whellam’s rink then a 4 on Mitch Brenner’s rink. About the same time Fords turned up the heat against Bob Druce’s rink. This still left Central with a healthy 9 shot lead at the halfway point. Over the next few ends Fords reduced the gap to 6 then a count of 6 on Mitch’s streched the lead again. In the last third of the match Paul and Mitch’s rinks more than compensated for the troubles Fords were heaping on Bob’s rink. Central’s combined score pushed further and further out in front until the final score finshed 68 – 50 in their favour. Central go on to play in the Final at Romford on 14th September.